We can help spread the word about your business to visitors who spend $4 billion in The Mile High City every year. Join our network of nearly 1,300 businesses and become part of the visitor experience today. VISIT DENVER reaches out and promotes Denver to my potential guests. Their commitment to elevating the national perception of Denver's rockin' dining scene helps me fill my restaurants every night. VISIT DENVER has been our most valued partnership to grow our business, by far. We have seen our convention and meeting business triple since becoming members over 10 years ago. VISIT DENVER has continually exceeded our expectations in the way they represent their members and the city of Denver. VISIT DENVER has provided an invaluable promotional partnership for Denver Beer Co. The organization has introduced our brewery to many influential members of the Denver community, visitors to our state and city, and both local and national media. Further, this partnership has furnished many opportunities to participate in fun and unique collaborative events which have had a very positive impact on our marketing efforts and visibility locally, nationally and even internationally. We are thrilled to call the VISIT DENVER team our partners and friends. — Patrick Crawford, Owner, Denver Beer Co. Joining VISIT DENVER is one of the best decisions we've made. Not only do their many publications offer great exposure for Work & Class; as an organization, they go above and beyond to support us, whether through a happy hour, a private event, or just by being conscientious and easy to work with. If you own a business in the hospitality industry, VISIT DENVER should be one of your first partnerships. Advertising and marketing opportunities are available to VISIT DENVER partners from travel and dining guides and e-newsletters to website and ad campaigns. 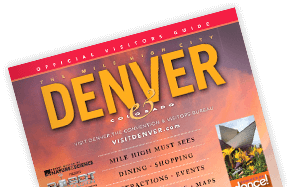 Discover the ways that you can Market with VISIT DENVER for free!